This is what the Lord that rose from the dead has seen. Despite his appearances to the disciples more than once and although He singled Thomas with a special appearance to relieve any doubt that he has had, we still find Him accompanying Peter, who had called the disciples to go back to their old job after completely abandoning it, Peter revealed this to the Lord saying “See, we have left all and followed You.” ( Luke 18:28). 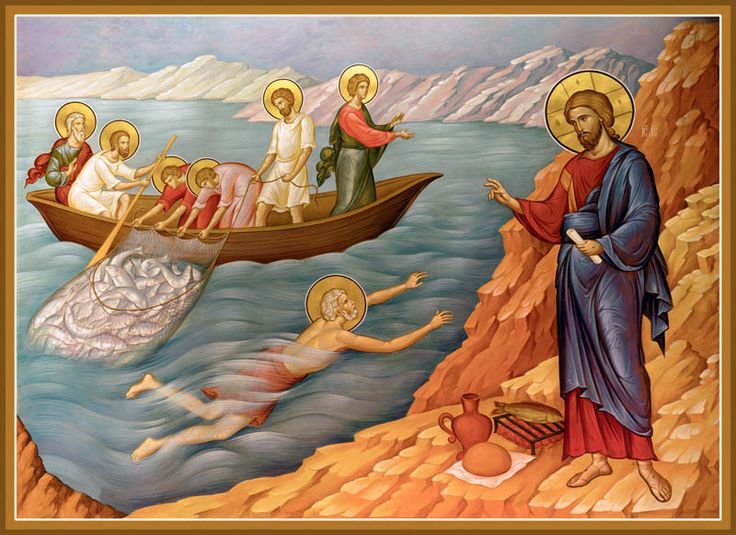 Yet we were surprised by that strange call from Peter to some of the disciples “I am going fishing.” They said to him, “We are going with you also.” They went out and immediately got into the boat, and that night they caughtnothing” ( John 21:3). The Bible didn’t refrain from mentioning the seven names of the retreatingdisciples” Simon Peter, Thomas, Nathanael of Cana of Galilee, the sons of zebedee and twoother disciples” ( John 21:2). It was not strange for them to spend the whole night withoutcatching one fish. Didn’t the Lord tell them” for without Me you can do nothing” ( John 15:5)?How then, after three years and more of the Lord’s teaching and the revealing of His divinitythrough miracles and signs in front of them, and how all the prophecies were fulfilled in His birth,life, death and resurrection, how after all this and after His appearance to them, their heartsremain stiffened and slow to understand with doubt controlling their souls?! And after successiveattacks from satan they decide to abandon the beautiful dream that they had lived with theirmaster for three years and more, waking up on doubts that blow their faith away under thepressure of materialistic needs for them and their families not knowing that by doing so, they areretreating and becoming boys again?! And do not rush in blaming and judging them, for we are all hit with doubt in God’s love,fatherhood and His ability and compassion, forgiveness and care when we fall in a diverse oftemptations. We then cry with the psalmist” How long, O Lord? Will You forget me forever?How long will You hide Your face from me?How long shall I take counsel in my soul, Havingsorrow in my heart daily? How long will my enemy be exalted over me? ( Psalm 13:1-2). Thenwe having no confidence in God seek refuge in people, bribery, money and sometimesquackery, magic and desist falling into the lap of satan. It is the calamity of this era which we livein, the lack of faith and the abandonment of our life with God, trying to catch something withoutHim in this world that has been put in the evil one. But we can’t. Not even boys but babies infaith. And here we remember the words of the Lord” I tell you that He will avenge them speedily.Nevertheless, when the Son of Man comes, will He really find faith on the earth?” ( Luke 18:8).I’m afraid that we get to the point in which we descend from being men of faith to become boysin the eyes of the Lord. Let us hear the words of the apostle Paul appealing to us, saying”Watch, stand fast in the faith, be brave, be strong” ( 1Corinthians 16:13).Doubt is the first weapon that Satan use to attack faith with, leading to fear. And the only way toovercome it is to follow what the Lord asked his disciples to do in gethsemane” Watch and pray,lest you enter into temptation. The spirit indeed is willing, but the flesh is weak.” ( Matthew26:41). And Saint Peter says” Be sober, be vigilant; because your adversary the devil walksabout like a roaring lion, seeking whom he may devour. Resist him, steadfast in the faith,knowing that the same sufferings are experienced by your brotherhood in the world” ( 1 Peter5:8-9). Yes He is the Lord that appeared to the hopeless disciples that doubted His resurrection. Theword that was said” Therefore that disciple whom Jesus loved said to Peter, “It is theLord!” ( John 7:21). He is the Lord who watches over His followers and those who believed inHim once and then got hit by the waves of doubt and uncertainty in His strength and Hisresurrection, which is theirs. He is the Lord who comes to us on the shore of our Tiberia, thatwhich can not give us a catch without Him. The Lord that tolerates our weaknesses andhardened hearts. Yes He is the Lord who orders for riches when we are spiritually, or evenphysically running out. Didn’t He ask the lads sayjng” Children, have you any food?”And they answered, no” ( John 21:5). Truly it is the ” no ” of poverty and need, the “no” of beinglost, away from God . They spent the whole night fishing without catching even one fish. Isn’tthat what happens to those who have gone astray away from their master and teacher? Isn’tthat what exactly happened with the prodigal son, when he depended on money and friends?! ““For My people have committed two evils: They have forsaken Me, the fountain of living waters,And hewn themselves cisterns—broken cisterns that can hold no water” ( Jeremiah 2:13). Andtherefore we do not become only empty handed m, but also thirsty and hungry. The Book tellsus about the prodigal son” And he would gladly have filled his stomach with the pods that theswine ate, and no one gave him anything” ( Luke 15:16). Thus is concluded in the verse” andthat night they caught nothing” ( John 21:3). He is the Lord, who shines with His righteousness and light on us when we waste our lives tobecome a dark night without any fish, missing eternal life, joy, peace and real satiety.when wefear and follow the Lord in our hearts, despite our weaknesses He shines and brightens ourlives with joy, light, satiety and happiness” In Your presence is fullness of joy; At Your right handare pleasures forevermore” ( Psalm 16:11). We saw the Lord” But when the morning had nowcome, Jesus stood on the shore; yet the disciples did not know that it was Jesus” ( John 21:4).Dear reader, whatever the losses that you have encountered whether on spiritual,psychological, or physical levels, seek the Lord, for He is closer to you than a brother, you willfind Him on the shore of your weaknesses, calling you to put all your worries on Him and Hispromises, catching a lot of fish on the boat of your faith, that leads to the safe shore, finding Himembracing you with love, forgiveness, satiety and joy.